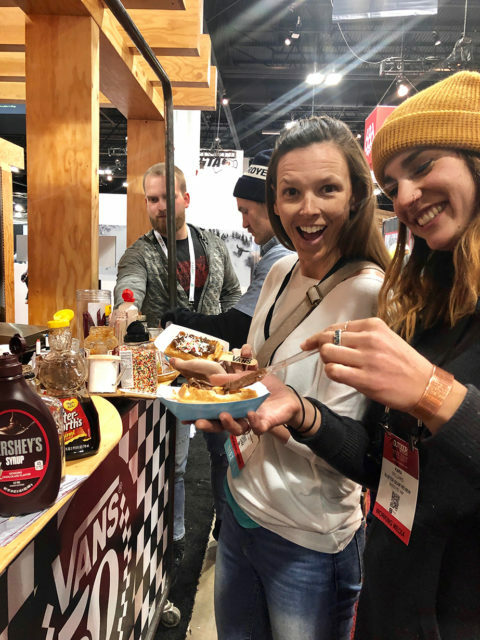 You may have seen it on our Instagram stories or heard about it on our GEAR:30 podcast, but last week we were at the Outdoor Retailer Snow Show (the trade show formally known as SIA). But the real point of OR is to see what all the brands having coming for the 2019-2020 season, and there is a lot to talk about. On that note, this is still one of the silliest things that happens at these trade shows — various media outlets rushing to slap all of these “Best New Gear” awards on various products they have not yet tested. To be fair, however, some of these publications don’t ever actually go spend much time testing these products anyway, so maybe that’s why they don’t see the problem / irony / idiocy of this? So here, we won’t insult your intelligence by throwing around the words “Best New” anything, but we will be highlighting the most intriguing, promising, and weird products and trends that we saw at the show. We love the men’s and women’s Descensionist Jackets and Pants, but they’re getting the ax for 19/20. We will certainly miss their combination of breathability, weather resistance, and a roomy fit. However, there is a silver lining, since the Descensionist’s replacement looks very, very interesting (see below). Those who know, know. And while there might not be a ton of people touring regularly on a 120mm-wide ski, the BMT 122 is an exceptional powder touring ski, and we are very sorry to see it go. Fortunately, the very good BMT 109 isn’t getting discontinued, but we know that Blister reviewer, Paul Forward, in particular will be very bummed about the BMT 122. Honestly — and quite surprisingly — we can’t think of any discontinued products where we thought to ourselves, Thank god that thing is gone! That said, after our initial time on several of K2’s new Mindbenders, we are very happy with the fact that they have replaced the previous “Pinnacle” series. Luke Koppa on the K2 Mindbender 99Ti, Crested Butte, CO. So there you go. And we shall see. But the new S/Pro boots do look promising. We were very happy to see that the vast majority of our “Best Of” winners in our 18/19 Buyer’s Guide will be coming back mostly unchanged for 19/20. Good job, companies! That said, we’re especially delighted that a few products are not getting changed for next year. 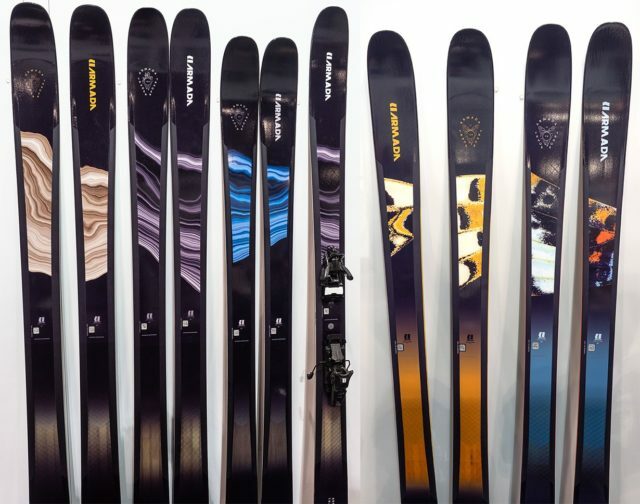 Turns out, Nordica is making a lot of good skis. And they’re not trying to fix things that aren’t broken. This is smart. Kudos. This is a really, really good resort pow ski, and for 19/20, the only change will be to its graphics. However, we’re also very excited about its narrower sibling, the Black Ops 98, which we should be getting on soon. Like the Black Ops 118 and Nordica Enforcer & Santa Ana series, Fischer recognized that the Ranger 102 FR is pretty dialed, and rather than change it, they just added a narrower version, the Ranger 94 FR. 19/20 Fischer Ranger 115 FR, Ranger 102 FR, Ranger 94 FR, and Ranger FR. 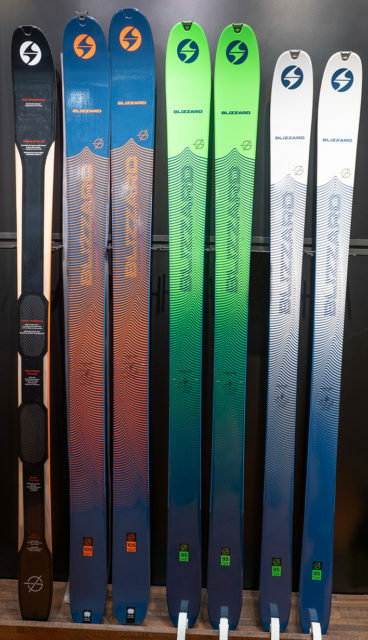 Blizzard’s touring skis used to sit on the heavier end of the spectrum, but they’re overhauling them for 19/20. We just received a pair of the new 188 cm Zero G 105, and it’s coming in over 100 grams lighter per ski compared to the current 185 cm Zero G 108. We’ll be talking more about these skis very soon. 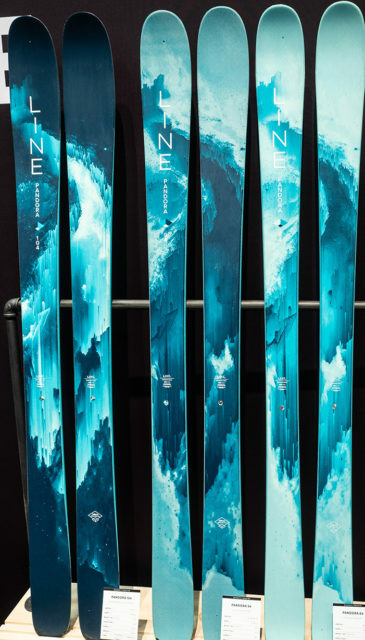 While Line is calling these “freeride” skis, the new Vision 98 and 108 are very light. Our pair of the 183 cm Vision 108 is coming in just over 1600 grams, and the 179 cm Vision 98 comes in well below 1500 grams. And yet, Line is still hyping up their downhill performance, so we’re very curious to get them on snow (which is happening soon). Alright, this is a pretty long list, so good job, ski industry. Actually, we’ve already tried it, and Blister Members can check out our Flash Review here. For all the reasons stated above. Stay tuned for First Looks and Flash Reviews of these skis. This is Eric Pollard’s new pow ski, and with truly convex tips and tails, it sure looks intriguing. We’ll be getting on it tomorrow. 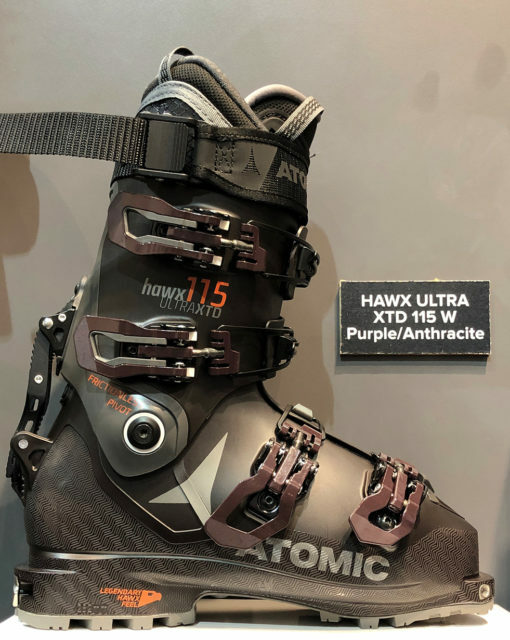 Atomic made several small tweaks to the liners (beefier), buckles (open wider), power straps (cam-style), and soles (Gripw Walk) of their Hawx Ultra XTD line of boots, and we’re pretty excited about all of the updates. We love the Prior CBC, but at ~118 mm wide, it can be overkill for most days. 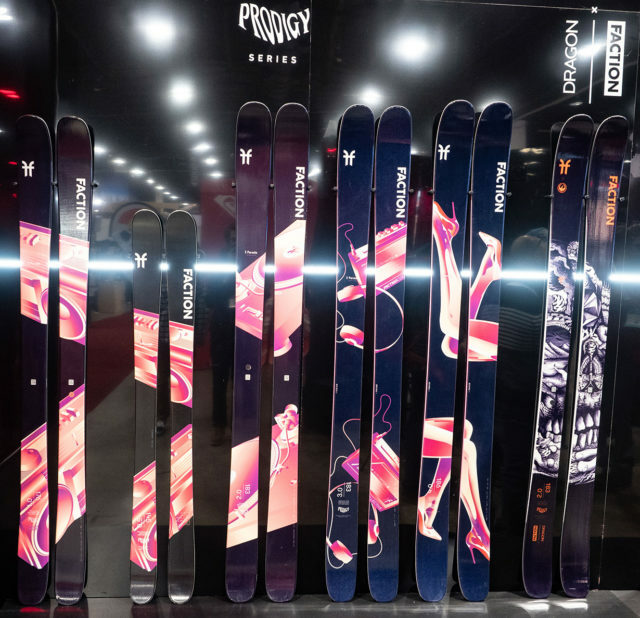 For 19/20, Prior is coming out with the Northwest 100 and Northwest 110 — all-mountain freestyle skis that are based on the CBC and designed to bring its strong-yet-playful feel to some more versatile widths. Fischer made some serious changes to their Ranger “Ti” series, tweaking the rocker profiles and weight. The new skis look and feel much burlier than the current iterations, which we’re psyched about. 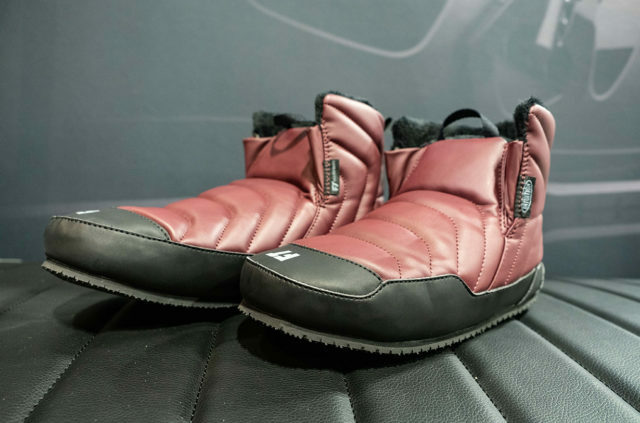 Atomic’s lightweight touring boots are also getting updated, and the new boots look very different than the current ones. The new Backlands no longer have a removable tongue or lower buckle, and instead, use a BOA closure. 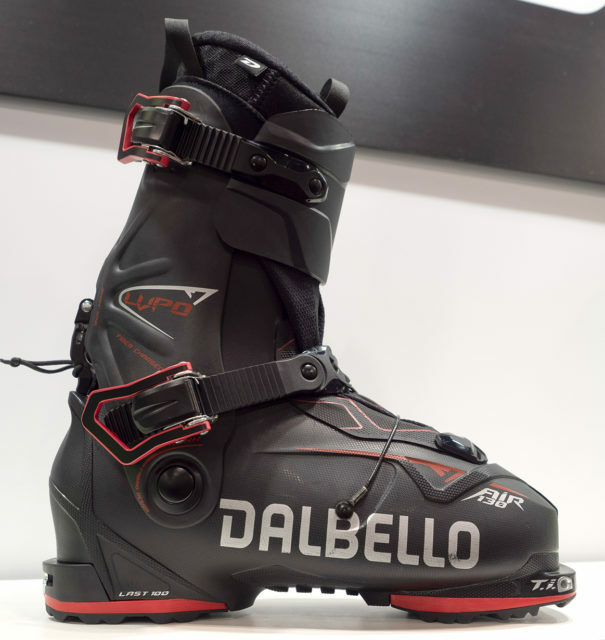 This will definitely cut down on the fiddle factor, but we’re more curious to see just how well the new boots ski. The Descensionist may be gone, but we’re very excited about its replacement. The Snowdrifter Jacket and Bibs (men’s & women’s) use a proprietary fabric that’s fully waterproof, but has an amazingly soft hand feel. Plus, the Snowdrifter packs (20L & 35L) look like really solid options for resort, sidecountry, and backcountry use. 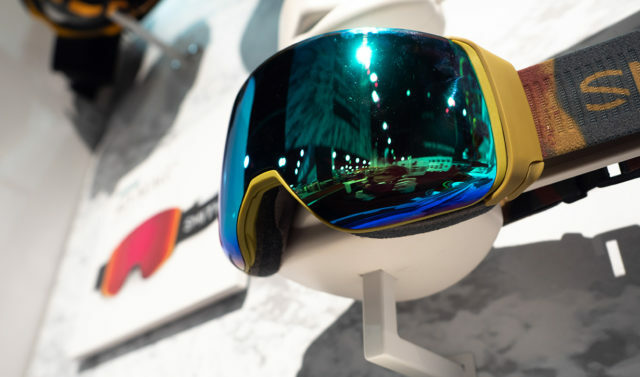 Smith launched their I/O Mag goggle this year, which has a magnetic lens swap system. Next year, they’re not only releasing a larger version and smaller version, but also the 4D Mag, which has a lens that extends below the frame to increase your field of view when looking down. Kristin Sinnott: While the men’s version is a hoodie, the women’s Holden Whole Garment base layer is a turtleneck and features the same seamless design, merino wool / recycled polyester material, and sleek design as the men’s. This base layer looks very, very cool. Kristin: These skis are reportedly more than just men’s skis with different top sheets. 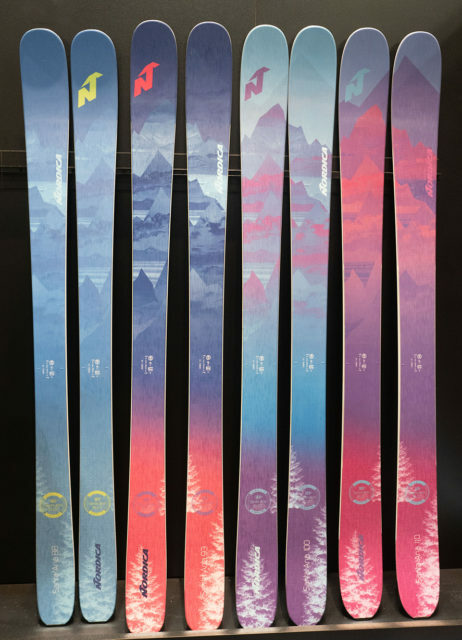 K2 says they designed each women’s Mindbender ski separately to make each one unique rather than just slightly wider or narrower than the next. 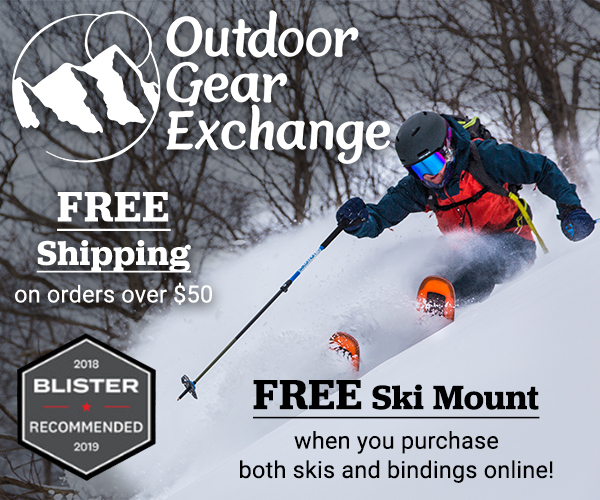 We are also excited that they are offering longer options in this women’s-specific line, such as the Mindbender 106C Alliance in a 176 cm, and the 115C Alliance in a 179 cm. Check out our First Look of the K2 Mindbender 98Ti Alliance. Kristin: This ski’s shape has been slightly modified for next season. As fans of the current model, we’re a little apprehensive about the changes, but mostly eager to see how the new design performs. 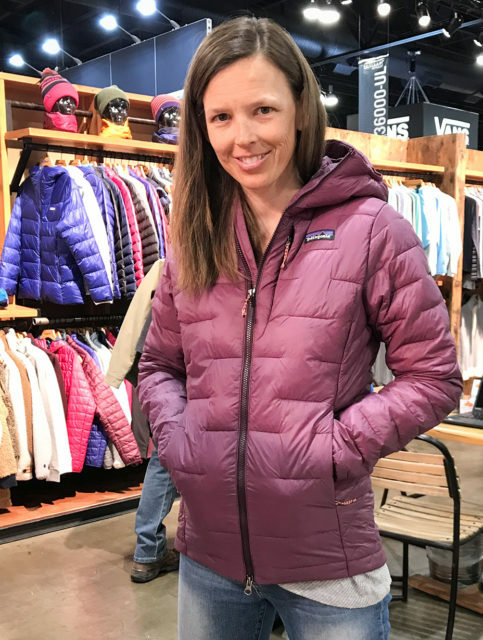 Kristin: Strafe is expanding their women’s line and we couldn’t be more excited since the new insulation layers and colors (think misty pink paired with navy camo) look and feel great. We’re particularly excited about the new print on the Scarlett Bibs. 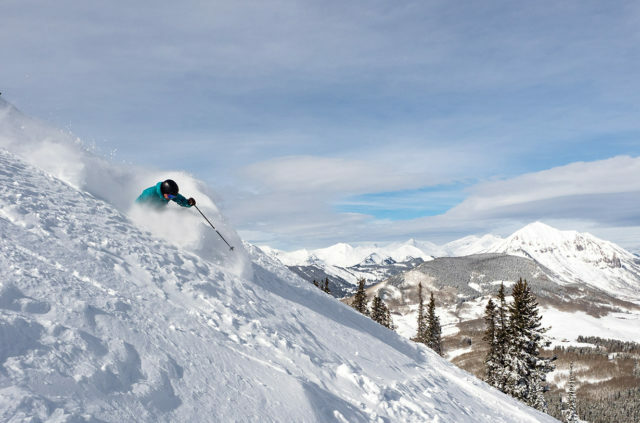 Kara Williard: We’re seeing a trend of more manufacturers coming out with stronger women’s boots, such as the Nordica Pro Machine 115, Salomon S/Max W 120, and Atomic Hawx Ultra 115 W. Women’s-specific boots in flexes stiffer than “110” have been in demand for some time, and we are stoked to see brands tuning into this. 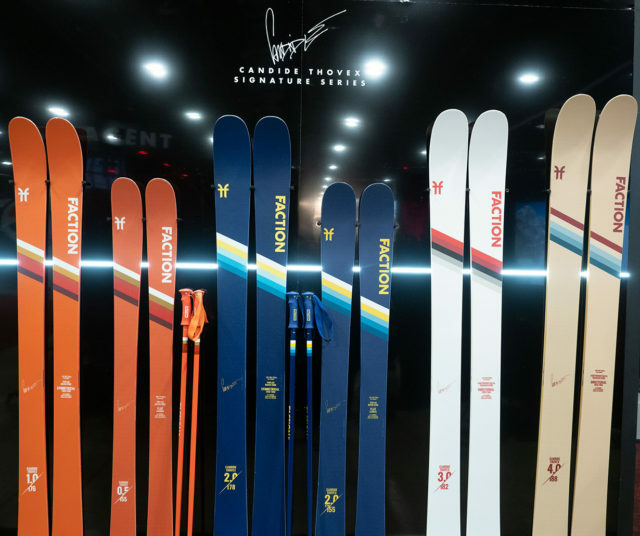 Kara: These new skis are the same construction as the well-liked men’s Candide skis, but are offered in shorter lengths and rad vintage graphics. 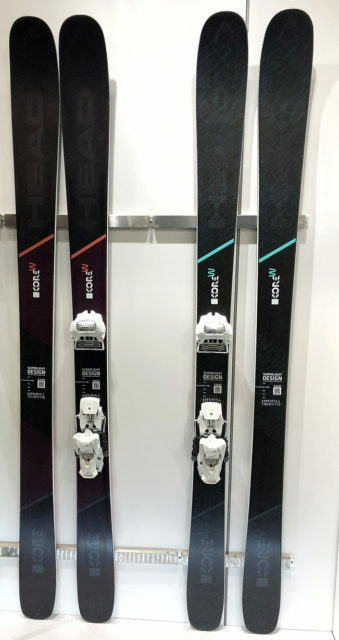 Kara: Women will no longer have to ski the “unisex” Head Kore skis, since a women’s-specific Kore 93 and 99 will be available for 19/20 with similar constructions but different length offerings. Blizzard added an 82 mm width to their Black Pearl all-mountain line, which we’re very excited about, given how much we’ve liked the Black Pearl 88 and 98. The most stoke-filled, fiery, and swagalicious moment of the show happened at the Stockli booth, when our editor in chief was told that several Stockli models were so vastly superior to everything else on the showroom floor that it wasn’t even funny. Not even close. The swagger was definitely on a hundred thousand trillion … and we loved it. Because if you know that you are making the best product out there, then screw false modesty. Just throw down the gauntlet. Because as Drake has taught us, you aren’t talking sh*t, you are simply stating facts. And we’ve been told that Stockli is going to be stepping into our testing arena this season, so let the games begin. 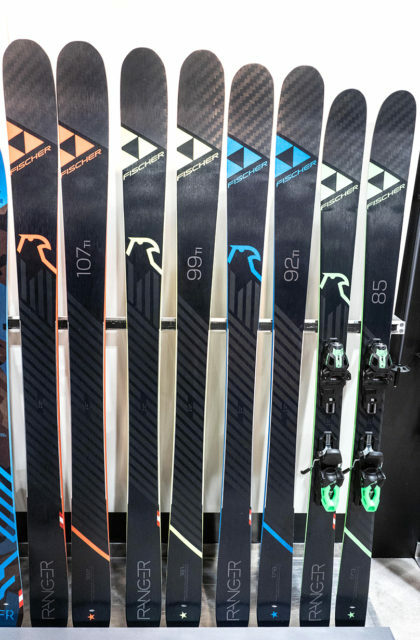 Fischer’s Ranger Ti line is currently pretty light, but as we’ve seen from a few companies this year, Fischer decided to put some weight back into the skis. The 19/20 Ranger 107 Ti, 99 Ti, and 92 Ti all feature a layer of titanal that spans edge-to-edge in the middle, and tapers to a point as you move to the tips / tails. The new skis feel pretty hefty and quite solid overall, and we’re very eager to get on them to see the on-snow result. This year, Line overhauled one of their most iconic park skis, the Chronic. Next year, it returns unchanged, apart from graphics. Yesterday, Blister reviewer Joey Teahan got them mounted and on snow, and we haven’t seen him this excited in a while. We’ll soon be getting a review up of the ski. We’ve received a number of requests for a review of 4FRNT’s freestyle pow ski, and we can now confirm that this review is indeed happening. Check out our First Look of the Inthayne. 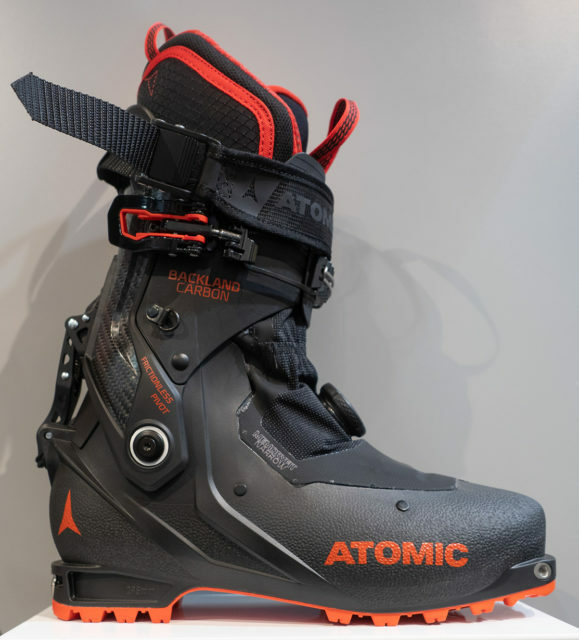 The Hoji Pro Tour is a really good touring boot, but it’s not exactly the stiffest touring boot out there, and it’s “Speed Nose” design means that it won’t work in MNC alpine bindings or some touring bindings like the Salomon / Atomic Shift MNC. 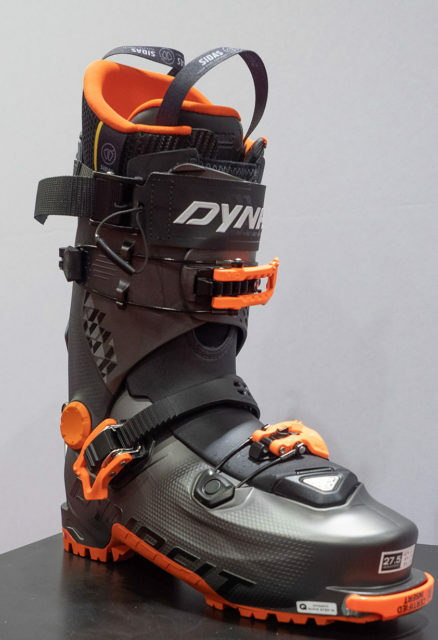 But next year, Dynafit is making a slightly stiffer version of the boot that has full toe and heel lugs, allowing it to work with MNC bindings and the Shift. Good Idea. Listen to our podcast with Hoji himself for more on the Hoji Free. The Blizzard Brahma is an exceptional ski, and arguably one of the very best skis in any category on the market today. But currently, it’s the narrowest ski in Blizzard’s “All Mountain Freeride” line. 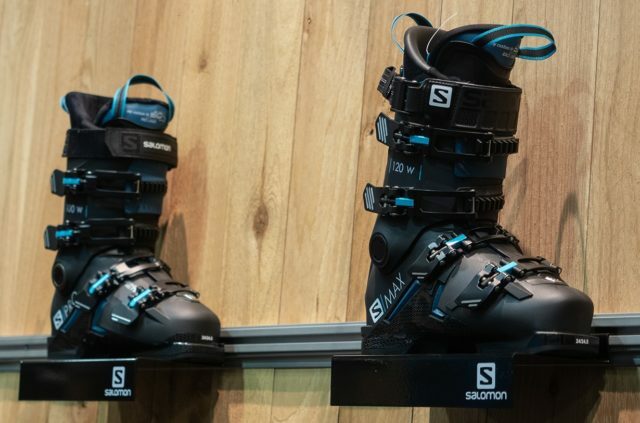 So next year, they’re adding a narrower, 82mm-underfoot version of the ski that ought to bite a bit harder on very firm groomers, and (potentially) ought to feel even quicker in bumps. 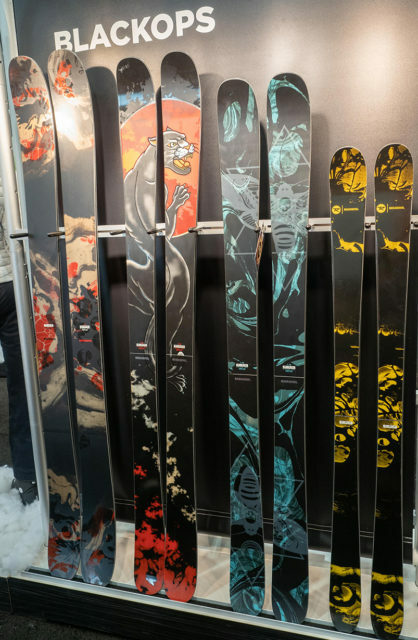 While Blizzard introduced a narrower addition to their all-mountain lineup, Volkl really kinda needed a wider one — if you wanted a metal-laminate, directional ski from Volkl, your options right now are the 96mm-wide Mantra M5, or the 117mm-wide Confession. That’s a big gap. So next season, they’re building off over the very good Mantra M5 and adding a wider Mantra 102. And on the women’s side, they’ll be making a wider Secret 102. Volkl Men's & Women's Freeride line, w/ Mantra 102 on far left and Secret 102 on far right. For 19/20, all of Patagonia’s shells and Black Hole bags will be made with recycled fabrics. Some use post-consumer recycled content, and others are made from polyester spun from recycled plastic bottles. 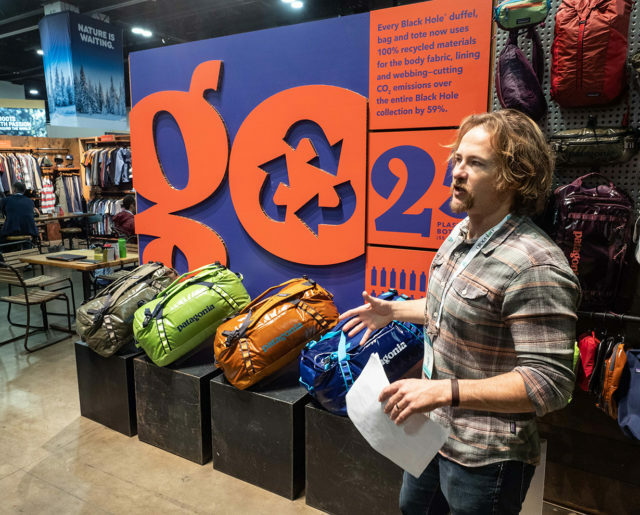 But both recycling methods are a step in the right direction, and we’d be happy to see the rest of the industry follow Patagonia’s lead. Corey Simpson discussing Patagonia's new, 100% recycled Black Hole line. 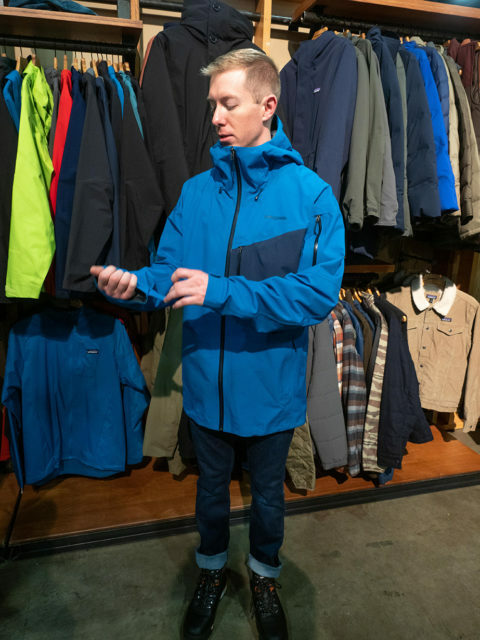 Luke Koppa: The Patagonia Micro Puff and Micro Puff Storm are seriously impressive garments. 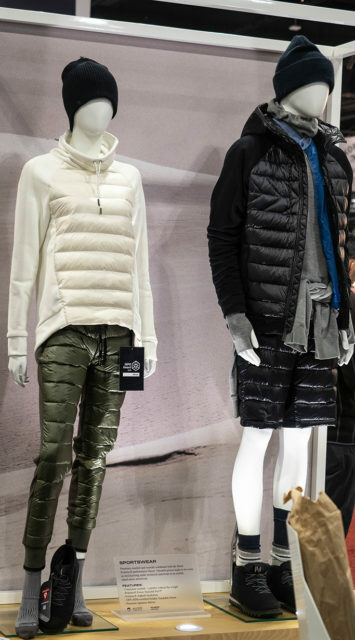 Next year, Patagonia is (finally) bringing their arguably revolutionary Pluma Fil insulation to a warmer garment, the Macro Puff. As you might’ve guessed by the name, the Macro Puff uses a heavier, warmer 135-g version of Patagonia’s synthetic Pluma Fil insulation (vs. 65-g insulation in the Micro Puff). For colder climates or use as an emergency or belay layer, the Macro Puff is very intriguing. Luke: Black Crows is expanding their apparel lineup for 19/20, and some of the pieces from both the resort-oriented Corpus and touring-oriented Ventus line look very cool. We’re particularly excited about the men’s Ventus 3L Gore-Tex jacket and pants, which use a 200-denier (!!!) face fabric and feels burly as hell. The Corpus 3L Gore-Tex jacket and bibs also look awesome for those seeking a more “freeride” fit with technical fabrics and features. Black Crows Women's Corpus Gore-Tex kit and Men's Ventus Gore-Tex kit. 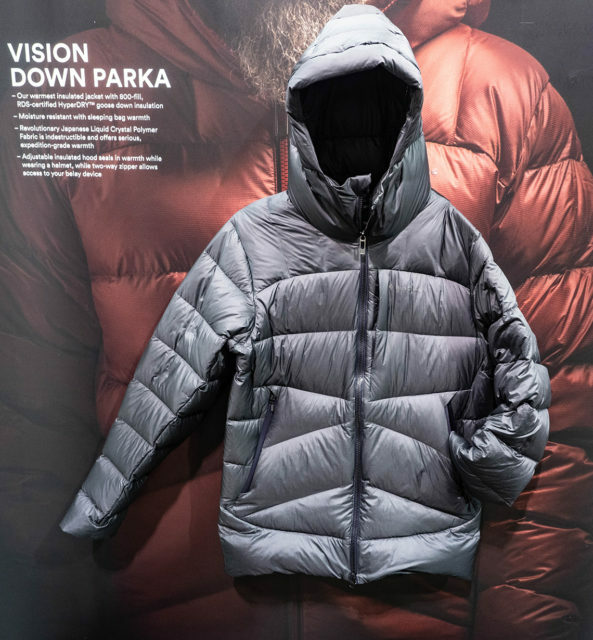 Luke: The Vision Down Parka uses RDS-certified, HyperDry-treated 800-fill-power down, but the really interesting thing about it is the “Liquid Crystal Polymer” fabric on the outer shell. Black Diamond was saying that they were running a knife over the fabric without being able to tear it. Yet, the jacket is still pretty light. If it lives up to the hype, it’d be an extremely impressive insulated jacket. 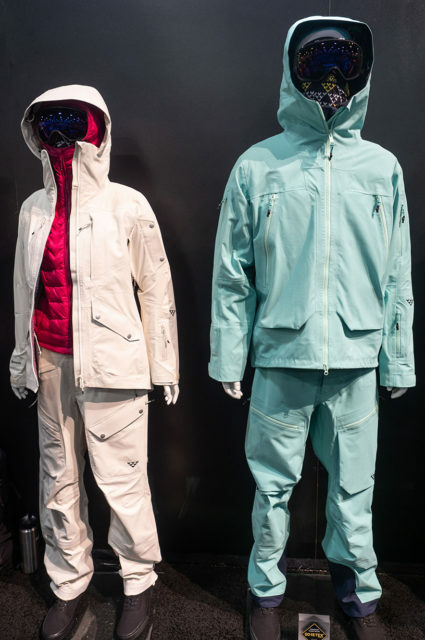 And we’d also be very interested to compare it to the Norrona Trollveggen ACE Down950 Jacket, as it’s another big, puffy down jacket that uses a “Liquid Crystal Polymer” exterior fabric. Luke: FW (which is supposed to be pronounced “forward” — screw you vowels and unnecessary consonants!) is a brand-new apparel brand. But despite being new to the game, their debut collection looks really impressive. The style definitely falls on the baggier, more “freeride” end of the spectrum, but all the designs look super clean, stylish, and were a welcome respite from the typical stuff we tend to see in the U.S.
Their 3L “Manifest” jacket and bibs use a Dermizax membrane (a membrane which we’re quite fond of), and have lots of seemingly useful features. And their insulated crewneck and waterproof anorak? Well, those had me and fellow outerwear-nerd, Sam Shaheen, geeking out pretty hard. Luke: Kristin already mentioned the women’s version above, but just to reiterate, we think Holden’s new seamless layers are really, really cool. Similar to the Patagonia Merino Air, Holden’s new base layers are knitted without seams, yet they still switch between high- and low-density knit structures throughout the garment in order to maximize breathability where you need it, and increase warmth in other areas. The merino / recycled polyester fabric also feels pretty great. Very excited to check these out. As always, we had a lot of great conversations at the show this year, but there are several people that are deserving of a shout out. Jonathan: Year after year, Corey is one of the most knowledgeable and impressive people we talk to when it comes to new product information, the rationale for the new products, how it differs from and attempts to improve upon what’s come before it, and distilling all of that down while covering everything from base layers to bibs to duffel bags. Furthermore, he somehow manages to do all this while displaying a genuine enthusiasm that doesn’t veer into bad marketing soundbites. And that is very refreshing in the outdoor industry PR world. Luke: It’s always great catching up with Nick, particularly because our meetings tend to be 50% detailed product talk, and 50% Nick making fun of Jonathan. Those are my favorite kinds of meetings. Jonathan: I realize that a lot of people will see this and think, “chique!” But for some reason, I can’t look at this outfit and not imagine being out in the galaxy on a spaceship with a creature (akin to the one in the movie, Alien) chasing me around the ship trying to eat my face off. And now Luke is threatening to get this outfit, hide in Blister HQ, and jump out while screaming at me. So, Chique or Murderous Alien Creature. Hard to say. Given the interest in lightweight, backcountry equipment, we’ve seen a lot of gear manufacturers start to also lighten up their inbounds skis, boots, bindings, and snowboards — even though this gear won’t be used for touring in the backcountry. But while lightweight gear is potentially less fatiguing and easier to carry from your car or bus stop to the chairlift, the fact is that heavier skis, boots, and bindings can offer superior downhill performance in terms of smoothing out variable snow, and providing better durability and sometimes more safety features. 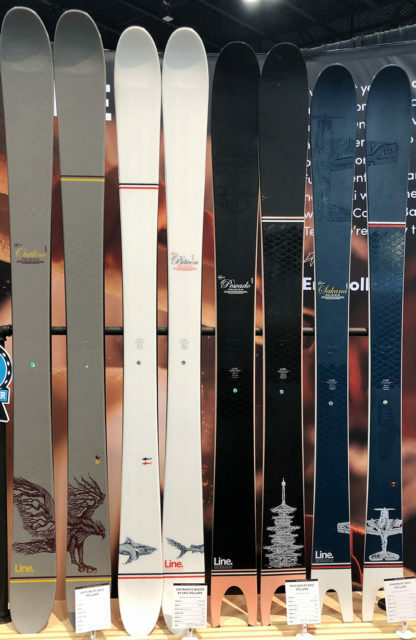 But while a number of companies are now introducing very lightweight resort equipment, we’re starting to see some companies making their skis and boards heavier than they could make them, out of a recognition that “lightweight” is not always better. 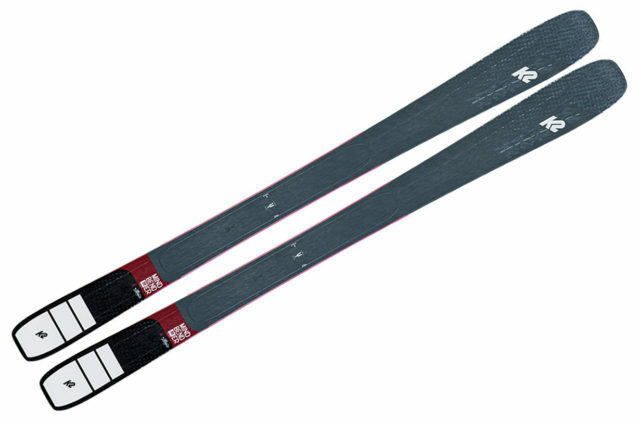 The K2 Mindbenders are one example, as are the 19/20 Fischer Ranger Ti skis. And we are here to encourage this, dear equipment designers. Tell your marketing departments to stop insisting that everything weighs next to nothing. While we see the need for high-performance, lightweight touring equipment, we feel equally strongly that skis, boots, bindings, and boards that will be used in ski areas (by people riding chairlifts) should not be designed to shave off as much weight as possible. In too many cases, it’s an unnecessary and detrimental compromise. We’re continuing to see more people venture into the backcountry. As a result, we’re also seeing backcountry skiers with much more diverse skiing styles. It’s no longer just ski mountaineers and gnarly big-mountain riders. Instead, there are more people touring to seek out pillows, cliffs, and other natural features. And some of them are spinning, flipping, and buttering off those features. Manufacturers seem to have recognized this, as we’re seeing more of them design lightweight skis with more forgiving flex patterns, more rocker, twinned tails, and more progressive mount points. Black Crows is releasing their Ferox Freebird, Moment is offering their Wildcat Tour 108 and Wildcat Tour 118, and Line is coming out with their new Vision 98 and Vision 108. All of these skis are designed to let you play around in the backcountry, rather than simply charge down your lines. This one arguably took much longer than it should have, but we’re finally seeing an industry-wide switch away from WTR, and toward Grip Walk. Having two vaguely standardized sole and binding standards was confusing and often annoying, so we are very happy to see the industry settle on one. That said, one trend we’d like to see disappear is dedicated touring boots getting equipped with Grip Walk soles. For 50/50 boots, we can see the value. But for boots that you’re primarily using to walk, scramble, and wander around in the backcountry, we’re much more in favor of full-rubber, rockered touring soles as they provide far better grip and walking efficiency compared to Grip Walk soles and their hard plastic AFD’s. 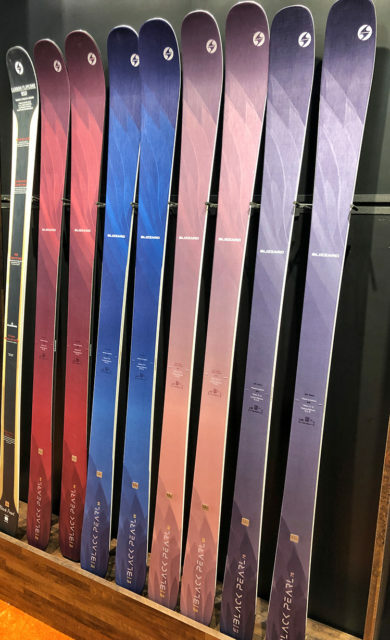 While we didn’t see a ton of new skis all fall into the same width range, there do seem to be an increasing number of skis that are filling the ~100-105 mm width range. 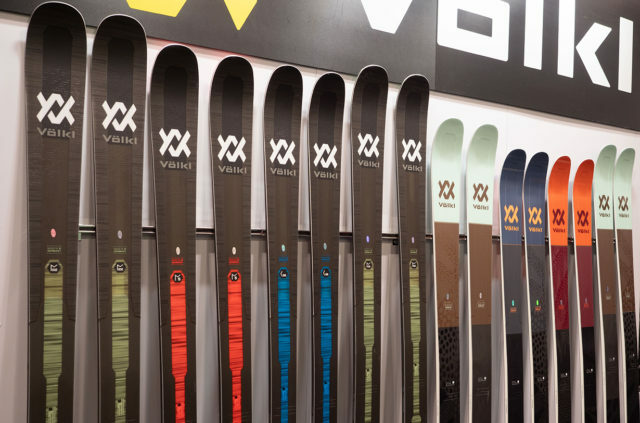 Volkl is introducing their new Mantra 102 and Secret 102, Nordica is making their Enforcer 104 Free, Fischer released their Ranger 102 FR last year, and then there are a number of other brands that have models in their lines that fall into this range (e.g., Blizzard Rustler 10 & Sheeva 10, Line Sick Day 104 & Pandora 104, Moment PB&J, Prior Flute, Faction Candide 2.0 & Prodigy 3.0, J Skis Vacation, and more). Jonathan: This was my favorite graphic of any board or ski that I saw at the show. I don’t think the photo does it justice, but the mix of colors that still reveal the natural wood grains of the board couldn’t have been better executed. Or more beautiful. 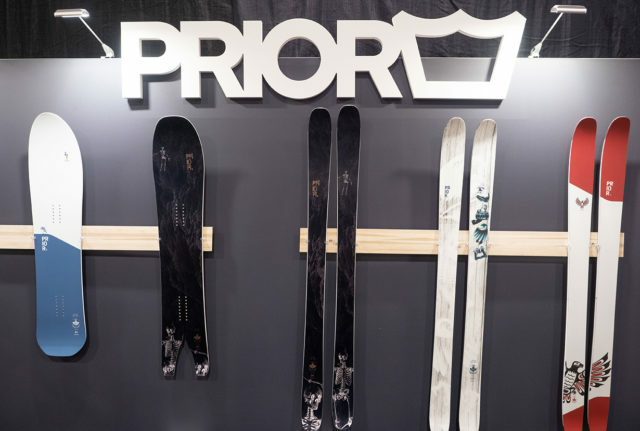 Prior was showing off a bunch of beautiful skis and boards at the show, with our favorites being their new blacked-out skeleton / fire graphic shown on the middle board and skis below, and the simple red / white graphic on the Overlord on the right. Line didn’t stray too far from last year’s graphics with the 19/20 Pandoras, but the new ones look amazing. 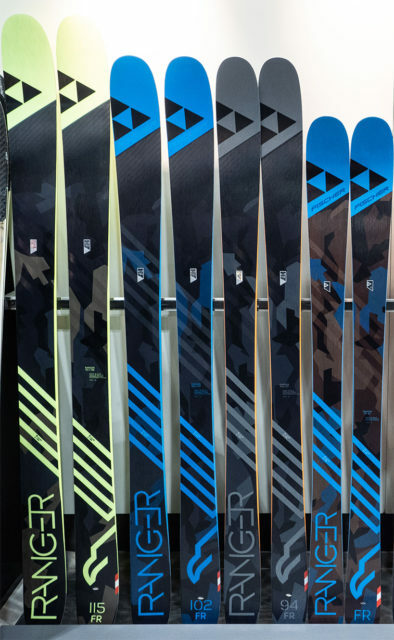 Armada’s redesigned men’s Tracer lineup and women’s Trace skis all look pretty great. Clean without being boring, and colorful without being obnoxious. Nice. 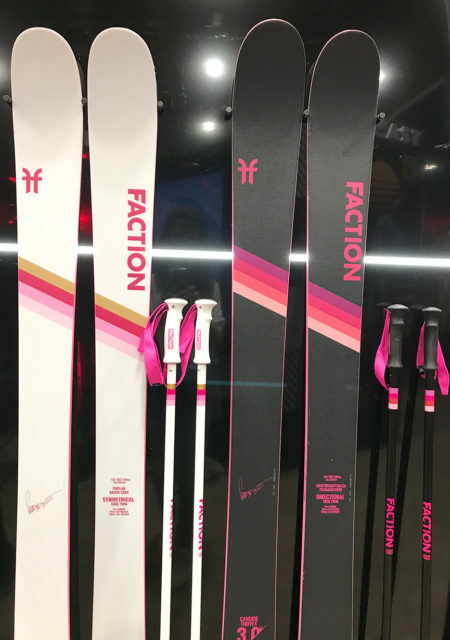 Faction again kept things simple with their Candide lineup, and these skis still look really, really nice. The white CT 3.0 and women’s Candide Mademoiselle line (see Part 2 above) look particularly great. 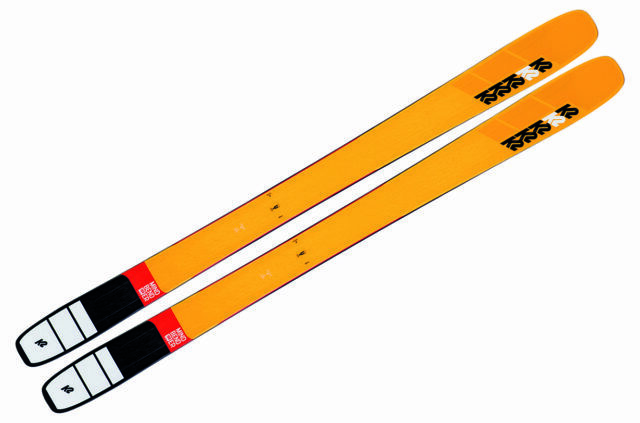 Plus, if you want to match your skis to your poles, Faction offers matching poles for many of the Candide skis. On the other end of the spectrum, Faction’s Prodigy lineup features much more complex, but equally rad graphics. Good job, Faction. Honestly, there weren’t any graphics that stopped us in our tracks due to how bad they were. One could argue that too many brands are now playing it too safe, and we think that’s a legitimate argument. But still, we didn’t see a lot of awful, so we’ll take it. We’ve received a bunch of requests for reviews of Stockli products, and that should finally be happening soon. I’ve already talked about this ski above, but the bottom line is that, if the Northwest skis can bring the playful, but still quite stable feel of the CBC to a more all-mountain friendly shape, I’d be a very happy guy. 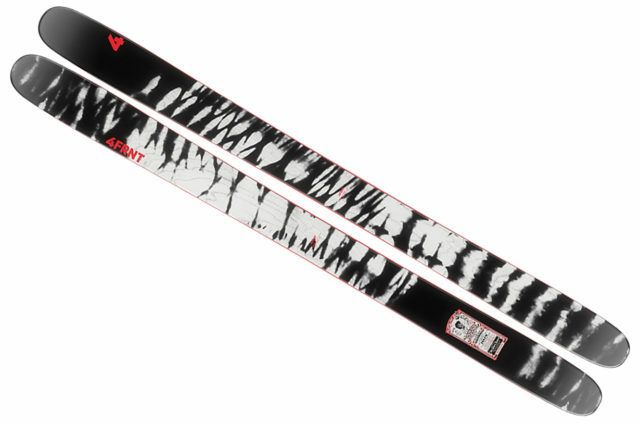 One of the additions to the category of playful touring skis, the 110mm-wide Ferox Freebird has a twinned tail, a moderate flex pattern, and is supposed to come in around 1800 g per ski for the 181 cm version. Add on to that its unique H-shaped carbon plate and pretty shallow rocker lines, and the Ferox Freebird certainly looks intriguing. Color me very, very interested, Black Crows. I’m a massive fan of the R1 TechFace Hoody, and next year Patagonia is releasing a pullover version without any lower pockets. Since I leave the R1 TechFace Hoody on almost all day when I’m touring, I don’t really need a full front zipper, and I don’t often use the hand pockets since they often get covered by a pack’s hip belt. Plus, the R1 TechFace Pullover is a bit lighter than the Hoody, which is a plus. Because who doesn’t need a pair of insulated booties? 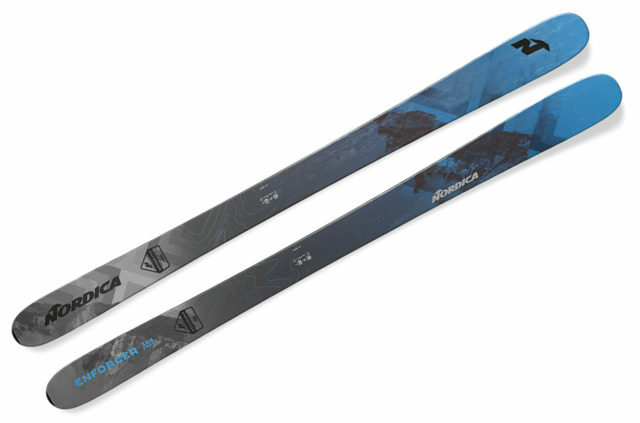 Blizzard is adding an 82mm-wide all-mountain ski to their excellent women’s Black Pearl line, and given how much I’ve liked the Black Pearl 88 and 98, I’d be very excited to check out a narrower version. Glerups open-heel, 100% wool felted slippers have been my go-to slippers for the past two years, and I was just informed they make baby and toddler shoes. As a new mom that still likes to get outside, I’ve found that the hardest thing to do is keep my little one’s feet warm when skinning a lap at our local hill. Glerups baby booties should easily remedy this problem. While it wasn’t designed for directional skiers like me, the new Koala 119 really grabbed my attention. The ski has a twinned tail and a progressive mount point, but the Koala 119 is by no means some jib noodle. It’s quite stiff, and felt nicely heavy and substantial. And I just keep thinking that the 184 cm Koala 119 could be a really great pow ski for sneaking through a bunch of the tight and techy lines you find in Crested Butte. Some years are revolutionary (e.g., see last year’s awards), and other years are more evolutionary. This year seemed to be a case of the latter, with a lot of very cool-looking products, but nothing that seemed like a huge step above everything else on the market. So while we aren’t naming any specific product for this award, there are definitely a bunch that we’re eager to check out, and that we’ve already started testing. And we’ll be back at it again as you’re reading this. Great job again BLISTER…very interesting read and I’m looking forward to more follow-ups. One thing I would like to know, was ASTIS (gloves and mittens) at the OR show? I could not find them on the official list, however if they were there did you have a close look at their offerings and were there any significant changes that you could comment on in regard to their products. Unfortunately we did not see Astis at the show, but we’ll look into reviewing some of their mitts / gloves in the future. I wear astis gloves and love them. Super warm. Amazing on storm days. My pair is 2 years old and my wife ordered a pair this year and comparing hers to mine it seems like the quality has gone down. So glad you highlighted this. I live in Utah and my home resorts are Deer Valley (where I work) and Canyons (where I play). My daily driver is an Enforcer 93 in 185 which I absolutely love and my powder ski is a Backland 109. During this most recent storm cycle (about 5 feet in 4 days) I noticed that except for the last day of the cycle (knee deep powder off Condor at Canyons), no particular day was especially deep and I was gravitating more towards my Enforcer 93 over the Backland and it got me thinking about adding a new ski to my quiver in the exact range you highlighted: 102-105. This also coincided with info getting leaked on the Enforcer 104 Free, which also grabbed my attention because of how much I love my 93. I feel that for the conditions (healthy, but not massive dumps of good quality snow) and terrain (more trees, less open bowls) I ski, a 102-105 is probably more appropriate than a 108+ “true” powder ski for 95% of days. If I do go over to Snowbird a big mountain (wider) ski is probably more appropriate but as the adage goes, I want a ski for the conditions I actually ski vs. the conditions I want to ski, so for those reasons I am VERY excited about developments in this class and can’t wait to read more – especially about the 104 Free! Please finally review the Dalbello Lupo line (and not just the Air the other more resort orientated options)! My Latigo look great next to the Brahma, 78 is an excellent complement to the heart of the quiver Brahma. Is the Bushwhacker not in the picture? Really glad to hear you will be getting your hands (feet?) on some Stoeckli skis soon, be really interested to hear what you think. I had a pair of the Stormrider 88’s for a day last season and liked them a lot, keen to try the 95 and 105’s. The AX and CX carvers were great too. Only problem is they are all expensive!